the comprehensive Fax Testing Solutions over IP, TDM and PSTN networks. Mr. Bichefsky explained, “GL provides comprehensive Fax Testing Solutions over IP, TDM and PSTN networks using its products: Fax Pass-Through mode is a method of transmission of modulated fax data over an IP transport. The support for simulation of Fax over IP in Pass-Through mode (using G.711 PCMU and PCMA) has been recently introduced in all IP based MAPS™ simulation products supporting RTP traffic simulation over an established call. MAPS™ is GL’s standard framework for emulation of signaling and traffic for a vast array of communication protocols covering IP, TDM, and Wireless protocols. Applicable products are: MAPS™ SIP, MAPS™ Skinny, MAPS™ MEGACO, MAPS™ MGCP, MAPS™ SIP I, MAPS™ BICCIP, MAPS™ IuCS, MAPS™ IuH, and MAPS™ GSM A. The VQuad™ Probe (or VQuad™ coupled with Dual UTA) provides easy and flexible “quality of service” assessment across almost every network interface – whether it’s IP, TDM, Analog, or Wireless. It provides all pertinent real-time fax messaging with proper time sequences. In other words, one can follow the fax session from start to finish on both send and receive sides. GL has recently introduced bulk (100's) call Fax Emulator software that is capable of transmitting and receiving fax over many T1 E1 timeslots or through 2-wire FXO and FXS lines. The software can emulate many “virtual fax machines” - transmitter as well as receiver. GL’s FaxScan™ application is used to process 2-Wire and 4-Wire voice band capture for T.30 frames and PCAP captures forT.38 packets. User can extract a Fax TIF image, and decode general call-flow indicators for detail analysis. 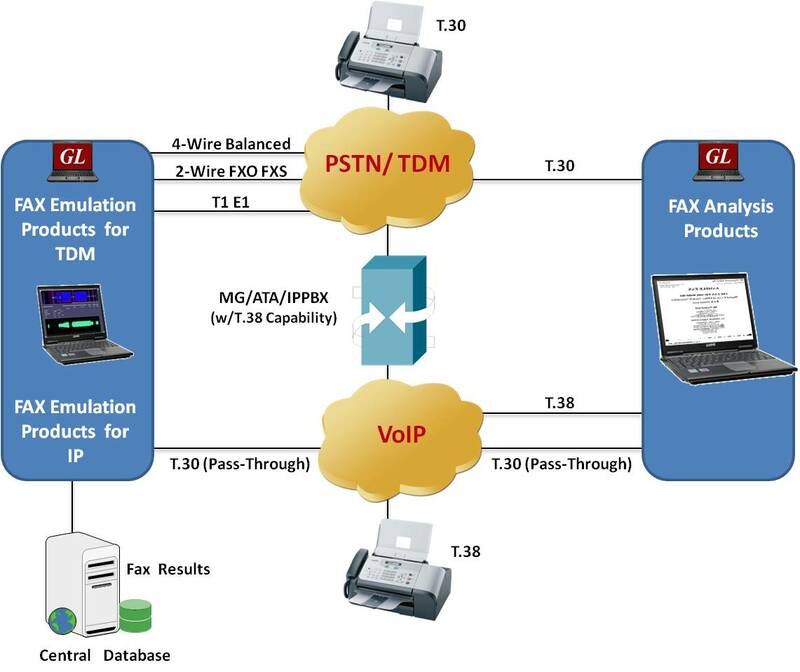 GL’s PacketScan™ software supports capturing and decoding of Fax (T.38 data) calls over VoIP. The fax decodes can be viewed in the form of T.38 call graph and call summary with decoded information for all T.38 messages received on the call.